Drake Neighborhood Community Garden offers a place to grow, learn and share at no charge. The Drake Community Garden rocks! That is according to Drake neighborhood residents, who add that Eddie Robinson and Rose Scott are a big reason why. 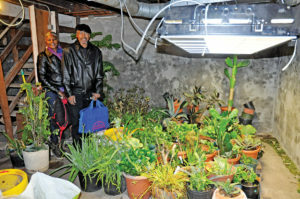 The couple is pictured here showing off their private, indoor winter garden. Those who know Eddie Robinson well say that he is multilingual — speaking English, Spanish and French — and a world-class pool player, mountain climber, master gardener and a breeder of unique types of hot peppers. But what does Eddie say? “I’m just a guy that loves plants,” he says. And what about Rose Scott? “I’m just a person who loves Eddie,” she says. The couple has been together for nearly four decades. During that span, the dynamic duo has become a bit of a local legend in the Drake neighborhood, becoming renowned for their growing skills and their dedication to the Drake Neighborhood Community Garden. Tomatoes, cabbage, broccoli, cucumbers. If it’s lush and delicious, there is a good chance you will find it growing at the garden. The chemical-free garden allows natural fertilizers only, and the grounds are mostly used to cultivate vegetables. The plots are offered to the public for free, offering the chance to grow a garden and pluck produce while learning new cultivation techniques. The green growing space is arranged annually into 30-40 sections — most measure 10 feet in one direction and 12 in another. Garden space is meted out on a first-come, first-served basis. Eddie and Rose took on the operational responsibilities of the garden nearly two decades ago. They train prospective green thumbs to excel at the craft that they know and love. Eddie says Iowa’s rich soil provides the opportunity to grow plants that are “a different kind of green.” He is a small-plot gardening guru that gives lectures on the topic, but he still learns from the diverse mix of growers who have converged from all around the globe to grow fresh produce. “We’ve had people from Pakistan, Afghanistan and from different parts of Africa,” he says. Other parts of the globe that have been represented include Sudan, Egypt, Somalia, Nigeria, Ghana, Liberia, Tibet, Monrovia and both South America and Central America. Part of the reason for the garden’s diversity is its partnership with Lutheran Refugee Services. Many of the gardeners are refugees from other countries. At the end of the last gardening season, the growers came together for a potluck, sharing produce and providing a taste of their respective home cuisines. “It brought everyone together,” says Rose. This is a great article! Eddie and Rose keep up the good work! !